Marmoleum Bulletin Board by Forbo is a linoleum surfacing material with a multitude of applications. The Bulletin Board is priced and ordered by the square yard. Its properties make it ideally-suited for use as a notice board; it also provides a functional finish to walls, furniture, door panels, and cupboards. The application of Marmoleum Bulletin Board in rooms shared by many people facilitates simple, efficient communication. 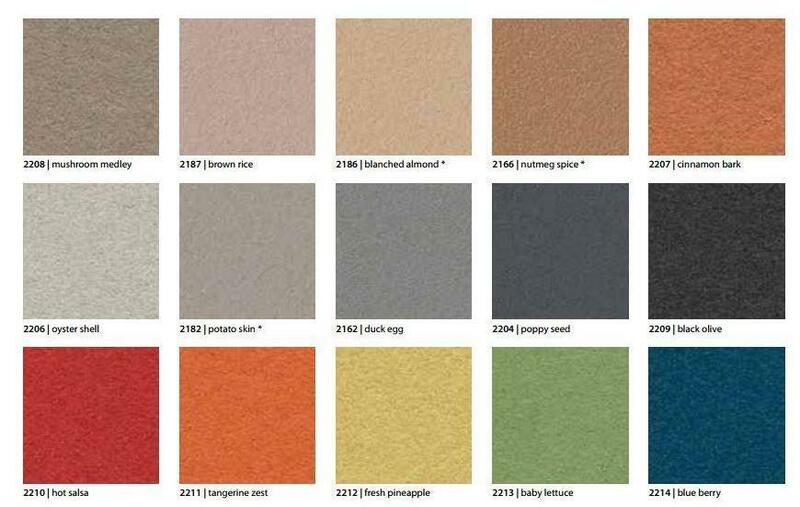 Marmoleum Bulletin Board is available in an exciting range of rich colors and intensities. The colors in the collection are suitable for combining with other materials such as wood, stone or aluminum, creating a functional and decorative finished product. Only colors 2166, 2182 and 2186 are available in both the 72" width and 48" width. The Forbo Bulletin Board is sold by the square yard. It will be cut to size based on the roll width and the number of square yards ordered. Please round up your requirements to the nearest square yard, and enter the number of square yards above. Please call if you need any assistance with your calculations. Marmoleum Bulletin Board is .5" (6. mm) thick. The roll is 92' long and is cut to size based on the number of square yards ordered. The bulletin board is available in two different roll widths - 48" and 72". There are 15 color options for the 48" and 3 color options for the 72" width (colors 2186, 2166 and 2182). To determine the number of yards to order, measure for your desired length (in inches) choose your roll width (48" or 72"). If you choose a width of 48" then divide the length by 27. If you want the 72" width, then divide the length by 18 to get the number of square yards needed. You must round up to the nearest square yard. if you want a piece of a bulletin board that is 4'x5', order the 48" width. The 5' length is 60" long, therefore divide 60" by 27 to get the square yards required; in this case, 60" divided by 27 equals 2.22 sq.yds so you would need to order 3 square yards. Class B when tested in accordance to ASTM E 84/NFPA 255, Standard Test Method for Surface Burning Characteristics. FSC1 – 54; SD – 316 when tested in accordance to CAN/ULC S102, Standard Test Method for Flame Spread Rating and Smoke Development. Self-Healing - Ability to self-heal from thumbtack and pin punctures.Does not dry out, crack or crumble. Tacks can be inserted easily and are gripped firmly. Resistance to Bacteria - Provides a self-sanitizing quality in the form of a bactericidal effect. Recent tests suggest the Bulletin Board Cork has a sterile zone around the material inhibiting contaminants such as Staphylococcus aureas. Construction that lasts. All natural tackable surface with unsurpassed durability, especially manufactured to stand up to the roughness of repeated school and industrial use and still look new, season after season, year after year. It's no miracle - just self healing. Thumbtack and pin punctures virtually disappear, leaving a clean, solid appearance and no unsightly pock marks. Resists drying, cracking and peeling. Imagine.. washable bulletin board or tackable surface! The surface can be wiped or washed using any common pH neutral cleaning method. Simply rinse with water after cleaning. A palette of attractive colors. Available in a range of colors to complement any interior or decor, with homogeneous construction, so that the colors go all the way through to the jute backing. The neutral and contemporary tones are low light reflective to diminish eye fatigue. It's a natural! Made from all natural ingredients- linseed oil, granulated cork, pine rosin binders on a jute back. Emits no harmful emissions, VOCs or carcinogens. Has properties that inhibit bacterial growth. And, even after a long life, the cork is bio-degradable. For wide application. Perfect for any environment where heavy use and a washable, tackable surface is needed. Ideal for classrooms, hospitals and busy offices, as well as display cases room dividers and other applications. Great for residential use in work spaces, play areas, craft areas and studios, kitchens, mud rooms, and more.